Austin, Texas — TEKVOX announced today that the world’s first Ultra High Definition (UltraHD) Quadview Classroom has been delivered, installed and is fully operational at Lone Star College’s Tomball Campus in Houston, Texas. “Lone Star College has made the decision to add the ground breaking UltraHD Quadview collaborative Classroom Solution from TEKVOX as the Campus Technology Standard for Collaborative Classrooms. We are very pleased with the result and already have additional rooms scheduled to be installed and more in the planning phase on our six campuses” said Butch Juelg, Associate Vice Chancellor, Technology Services for Lone Star College. Juelg added that, “TEKVOX’s Drop-In™ solution delivery method makes it very easy to deploy our standard room configurations in a highly cost effective manner”. The UltraHD Quadview Co llaborative Classroom is composed of four student huddle pods each equipped with TEKVOX’s 4K Quadview technology and the stations are interconnected through a powerful instructor podium providing state-of-the-art interactive teaching and collaboration capabilities. The system operates in two modes: Instructor or Student. In Instructor mode the instructor decides what the content is and what is shown at the large screen monitor and student displays. 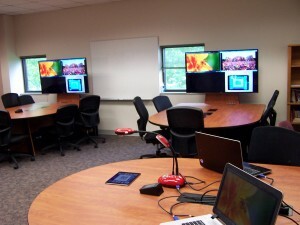 The instructor can even select a Student Pod to send to all of the other student displays. In Student mode a student can fully operate their own student station and collaborate together by selecting the Quadview mode on the student station touchscreen controller. “Lone Star College is a pioneer in embracing new technology to enhance the learning environment and we are proud to serve their mission with innovative, leading-edge solutions” said Jim Reinhart, CEO of TEKVOX. “Not only does Lone Star College drive innovation in technology but they demand solutions that are cost-effective and can scale with their footprint and growth. As a result, we are not only pioneering new technology together but are leading in the most ambitions assault on Total Cost of Ownership in the industry tackling all factors including the hardware, software, system integration, installation and maintenance”, said Reinhart. TEKVOX will be displaying the UltraHD Quadview Collaborative Classroom Student Pod at InfoComm 2015 in Booth 4372 held at the Orange County Convention Center in Orlando, Florida, June 17-19, 2015.